What's Up Birthday Cakes?! VGB is back and Aaron's Birthday Surprise Mystery is over! 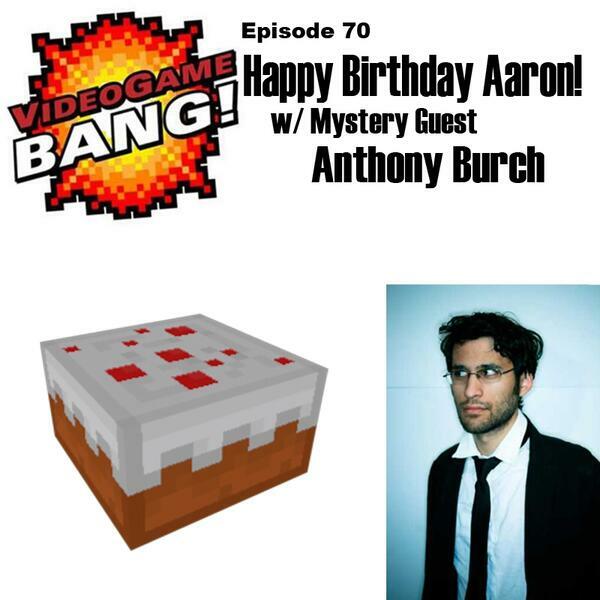 Our special guest of the week is none other than Anthony Burch! A man whose writing touched Aaron emotionally in Borderlands 2, is joining us to discuss why the decision was made to kill Sir Carter's favorite character. Will Aaron finally get the answers he is looking for?? Anthony did the show on EXTREMELY late notice and we cannot thank him enough for his time in sticking with us for the entire show! If you don't know who Anthony Burch is he is the wickedly smart and talented older brother of Ashly Burch. He talks to us about all things from #Gamergate to Impostor Syndrome, leaving Gearbox, and his new gig with Freddie Wong at Rocket Jump. As Aaron is one year closer to death we celebrate his life and some of his best moments on the show this week with none other than Schteven and Jada! We play a riveting round of Whattcha Playin?! as well as cover all of the geeky news stories in the world this week. We are talking about Spider-Man, Layoffs at Daybreak (Formerly Sony Online Entertainment) and much much more all on this weeks Birthdaytastic episode of Videogame BANG!